"Moist and delicious. 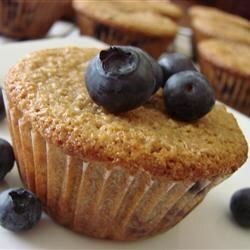 The blueberry orange touch add a special taste to ordinary bran muffins." Combine the oat bran and wheat bran in a large bowl. Stir in sour cream and milk. Allow mixture to stand for 10 minutes. Combine flour, baking powder, baking soda, brown sugar, and salt in a separate bowl. Gently stir blueberries into the flour mixture, carefully coating all the blueberries with flour. Stir vegetable oil, orange juice and zest, egg, and vanilla extract into the bran mixture. Combine flour mixture with the wet ingredients until just blended. Drop batter into lined muffin cups. Bake in the preheated oven until a toothpick inserted into the center comes out clean, 15 to 20 minutes. Cool in the pans for 10 minutes before removing to cool completely on a wire rack. The BEST! So glad you shared this one. My #1 picky queen granddaughter loves them as well. great way to sneak in some fiber. Make sure you double the recipe. It only made about 8 muffins. Very good. All around good!